Former US Secretary of State Hillary Clinton, right, and daughter Chelsea Clinton listen as US President Barack Obama speaks during the Clinton Global Initiative in New York, Sept. 23, 2014. If there is one thing Chelsea Clinton is most worried about, it may be that her soon-to-be child will grow up in a world without elephants. Standing alongside her mother, Hillary Clinton, at the Clinton Global Initiative this afternoon, the very-pregnant former first daughter warned the plight of African elephants, killed for their ivory tusks, is an "existential" one, and said that if the current poaching rates continue, elephants could be few and far between within the next decade. If so, this means Chelsea Clinton's favorite animal could be something her child would never know. "The child Marc and I are waiting to bring into this world could grow up in a planet without elephants," Clinton cautioned, before announcing a new commitment to stop the killing of African elephants and the trafficking of ivory. Chelsea Clinton said the African elephant crisis is not only a "moral" and "ecological disaster," but also a "security threat," as ivory is increasingly being used by the world's most nefarious terror groups, such as the Lord's Resistance Army and Boko Haram. She pleaded that "it's in all of our interests" to stop the growing practice. Saving the elephants is a favorite mission for the Clinton women. 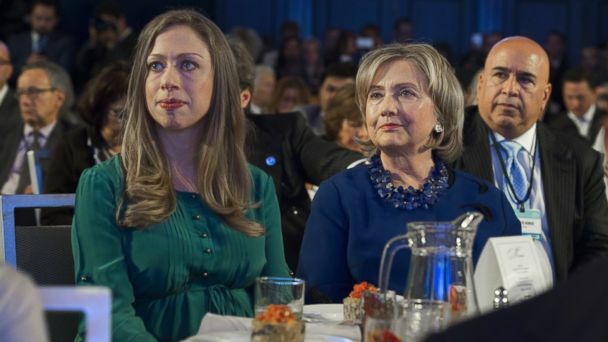 While making the announcement at the family's annual philanthropic meeting today, Hillary Clinton described the issue as something she and her daughter are "passionately committed" to, and said that Chelsea Clinton has made it a "priority" of the Clinton Foundation. Ahead of the birth of her child, Chelsea Clinton teamed up with the website BRIKA.com, to launch a line of elephant-themed gifts to benefit groups working to stop the international poaching of African elephants. She told the blog Refinery 29, she's even contemplating buying some of the pieces herself for an elephant-themed nursery. "We're very baby-oriented right now, so we'll definitely be buying a felt elephant or two. I think those will look great in our nursery. And, it's safe to say that as last year, this year too, a lot of our friends will be getting elephant-themed Christmas presents," Clinton said.